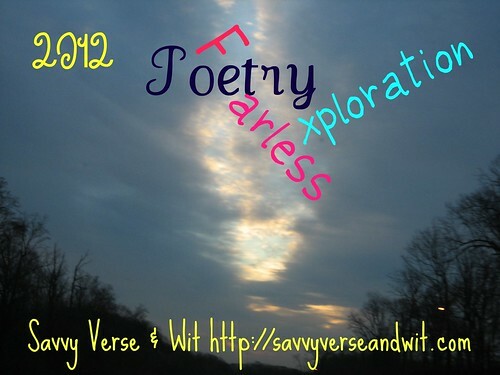 Even though National Poetry Month is over and the blog tour has ended, I’ve still got a couple poetry items to wrap up. First, thanks to everyone who participated this year, and I hope to see you all again in 2013. I’d like to recruit more poets, academics, and poetry readers to provide guest posts to other tour stops and to offer up their own blog stops on the tour. So if you’re interested, feel free to email me at any time. We had some great guest posts and reviews, and you can visit any of the posts or tour stops by clicking on the tour button. All of the links have been added to the Mr. Linky. If I missed a post from you, please feel free to add it. Second, I want to congratulate the winners of the National Poetry Month Blog Tour giveaway. Congrats to the five winners of the Trembling Pillow Press Journals: Elizabeth, Gerry, and Parrish Lantern. Congrats to the nine winners of Real Courage by Michael Meyerhofer: Leslie from Under My Apple Tree, Anna from Diary of an Eccentric, Kathy of Bermudaonion, Diane, and Chris. There are some winners I still have not received an address from, please send it along so I can mail out your prizes. The Day the World Ends by Ethan Coen, one half of the Coen Brothers film making team with great films under their belt like Brother, Where Art Thou? and No Country for Old Men, is a twisted and unexpectedly thoughtful collection in places. The limericks are bawdy and remind me of Christopher Moore’s humorous prose, but less in the smart and sassy humor and more in the low-class bathroom humor sense. Necromancy Never Pays stated that the poetry in the volume is geared toward a male audience, and in most cases, that is true — particularly with the dirty limericks. 'Was some snowman in my recent past? And if so, who fucked who? Additionally, Coen appears to love rhyme, no matter how trite or over-stretched it might be. Readers could find this collection amateur at best in how Coen chooses his rhymes, even when they have a tongue-in-cheek quality. Like the “bathroom” humor, these rhymes can get tiresome. Take for instance the rhymes in “Vine-Covered Verse” (page 53), “Lord, keep this farmer’s soul in peace,/For, though he dallied with his niece,/And cow, and nephew, none can claim/He, during, failed to praise Your name;/And how commit a lesser sin/When neighbors are but kine and kin?//” However, even in this poem, there are moments of deeper thought in which the narrator is asking what sins are worse and should they all be forgiven or all be condemned. It also questions how well we know our partners or other humans in general and what secrets they will take to their graves. Coen’s poetry in this collection seems built for laughs among men mostly, though there are moments in which the poems are not trying so hard to be humorous. There are some with an anachronistic quality to them, while others like “My Father’s Briefcase” are more serious and reflective. “Therapy” uses humor and disdain to point out the inane struggle we have against aging and the depression that accompanies the process of aging, as the narrator talks of his depression to a less-than-helpful therapist. The Day the World Ends by Ethan Coen is not for everyone and could be trying if read from cover to cover, but for those looking for a humorous romp on the underside of humanity, take a dip into these pages. Ethan Jesse Coen is one half of the American film making duo the Coen brothers. Their films include Blood Simple, Fargo, The Big Lebowski, O Brother, Where Art Thou?, No Country for Old Men, and True Grit. The brothers write, direct and produce their films jointly, although until recently Joel received sole credit for directing and Ethan for producing. They often alternate top billing for their screenplays while sharing film credits for editor under the alias Roderick Jaynes. 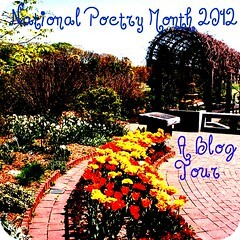 Leave a comment about what tour stop on the National Poetry Month Blog Tour you’ve enjoyed most, either here or on one of the participants’ blogs. Blog, Tweet, or share the link on Facebook for up to 3 additional entries. Deadline is April 30, 2012. This is the 11th book for my 2012 Fearless Poetry Exploration Reading Challenge. 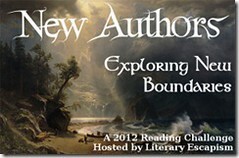 This is my 29th book for the 2012 New Authors Challenge. 1. Archie’s War by Marcia Williams, which I bought. 2. The Aleppo Codex by Matti Friedman, which I received from Algonquin and will be finding a new home for. 3. A Land More Kind Than Home by Wiley Cash, which I received unexpectedly from William Morrow. 4. Sacre Blue by Christopher Moore from William Morrow. I cannot tell you how excited I am to read this one! 5. Listening to Africa by Diana M. Raab from the poet. 6. Oklahoma City by Andrew Gumbel & Roger G. Charles from William Morrow unexpectedly. 7. Wonderstruck by Brian Selznick from Novel Places for Book Club. 8. Ashes by Ilsa Bick from Novel Places for Book Club. 9. The Day the World Ends by Ethan Coen from the publisher for review in April.